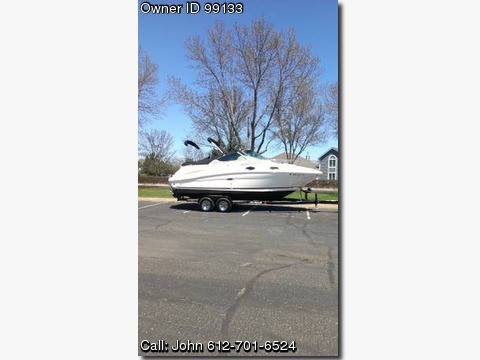 Please call boat owner John at 612-701-6524. Comes with a painted steel trailer. This boat would make a great Mothers day gift for your wife. 2011 Sea Ray Sundancer 240. I purchased this boat brand new with 2 hours in March of 2012. The boat has been stored indoors in the winter &amp; has always been professional winterized. It comes with a tandem axel trailer. Motor is a 5.0 liter Mercury with a bravo 3 lower unit. Boat is in near mint condition has 2 small dings in the gel coat up on the bow. It has approximately 150 hours on the motor will come with the balance of all factory warranties. I am selling this boat as we have out grown it &amp; have moved up to something larger. Twenty-four foot boats don&#39;t have much room to spare when the designers fit in usable below decks accommodations and a cockpit big enough for daytime boating. Is it better to sacrifice the cabin for a bigger cockpit, or vice-versa? Sea Ray handles this dilemma as well as any company we think: In the 240 Sundancer, they&#39;ve combined a comfortable cockpit with a cabin adequate for weekending — or longer, with an adventurous crew. And there&#39;s a mid-cabin with a double berth; yes, it&#39;s roll-in, roll-out, but we prefer that to sleeping on the V-berths. cockpit photos are stock photos from sea ray. The interior of the boat looks identical.